If 1.5°C Global Warming by 2100, the losses will be 6% of insects, 8% of plants, and 4% of vertebrates. If 2.0°C, the losses will be 18% of insects, 16% of plants, and 8% of vertebrates. If around 3.2°C (correspondent to the current pledges of the Paris Agreement), the losses will be around 49% of insects, 44% of plants, and 26% of vertebrates. For plants and vertebrates, the number of species losing more than half their geographic range by 2100 is halved if warming is limited to 1.5°C, compared with 2°C. However, for insects, the number is reduced by two-thirds. Read more about the research in The Guardian: ‘Climate change on track to cause major insect wipeout, scientists warn‘. Information on wildlife degradation due to global warming interacting with wildlife degradation for other reasons than just the warming is listed below. The Invasives Blog, 2017: ‘Invasive species, climate change and tourism impacts the greatest threats to natural World Heritage‘, 2017. State of the Planet, Colombia University: ‘What is Biodiversity and How Does Climate Change Affect It?‘, 2018. The Guardian: ‘A third of world’s nature reserves severely degraded by human activity‘, 2018. The Guardian: ‘Warning of ecological Armageddon after dramatic plunge in insect numbers‘, 2017. Smithsonian Ocean Portal: ‘Ocean acidification‘. 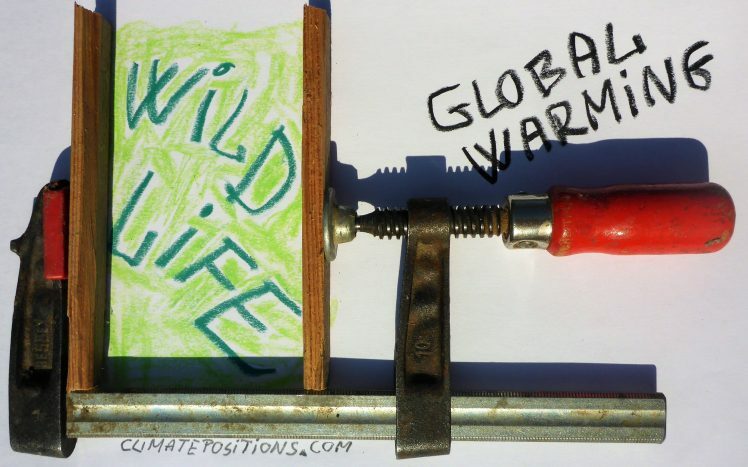 Union of Concerned Scientists: ‘Is Global Warming Fueling Increased Wildfire Risks?‘. Eco-Business: ‘World’s oceans losing oxygen as a result of global warming and pollution‘, 2018. The Guardian: ‘Alien species invasions and global warming a ‘deadly duo’, warn scientists‘, 2017. Science Direct, research: ‘Quantifying the impacts of sea-level rise on coastal biodiversity: A case study on lichens in the mid-Atlantic Coast of eastern North America‘, 2016. Climate Citizen: ‘Sea level rise hidden impact on Biodiversity and Habitat loss‘, 2012. British Ecological Society: ‘Patterns and drivers of biodiversity–stability relationships under climate extremes‘, 2017. Quora: ‘What are the causes for depletion of wildlife?‘ (10 answers), 2016. IUCN, Issues Brief: ‘Invasive alien species and climate change‘, 2017. Science News: ‘Invasive plants have unprecedented ability to pioneer new continents and climates‘, 2017. The Global Soil Biodiversity Initiative: ‘Major threats to soil ecosystems from a combination of invasive species and climate change‘, 2018. NCBI, research: ‘Protected areas offer refuge from invasive species spreading under climate change‘, 2017. NCBI, research: ‘Climate change and biological invasions: evidence, expectations, and response options‘, 2017. UKessays: ‘Climate Change Biodiversity And Ecosystem Loss Environmental Sciences Essay‘, 2015. Science Direct, research: ‘Soil fauna responses to natural disturbances, invasive species, and global climate change: Current state of the science and a call to action‘, 2017. Entomology Today: ‘Predicting Shifts in the Range of Invasive Insect Species in the Face of Climate Change‘, 2017. Carbon Brief: ‘Rainforests: Scientists concerned climate change is altering the tropical life cycle‘, 2018. Science: ‘Biodiversity redistribution under climate change: Impacts on ecosystems and human well-being‘, 2017. The Guardian: ‘Climate change: global reshuffle of wildlife will have huge impacts on humanity‘, 2017. The Guardian: ‘Destruction of nature as dangerous as climate change, scientists warn‘, 2018. ABC News: ‘Antarctica: Decline in biodiversity expected as climate change leads to growing ice-free areas‘, 2017. Nature, research: ‘Climate change is making algal blooms worse‘, 2017. Since 2000, the twelve most ruthless climate destroying countries have been: Qatar, Kuwait, Brunei, Trinidad and Tobago, Luxembourg, Oman, United Arab Emirates, Australia, Canada, Saudi Arabia, United States and South Korea (see the per capita Climate Debt ‘Ranking‘ of 163 countries). Drawing/image by Claus Andersen, 2018.